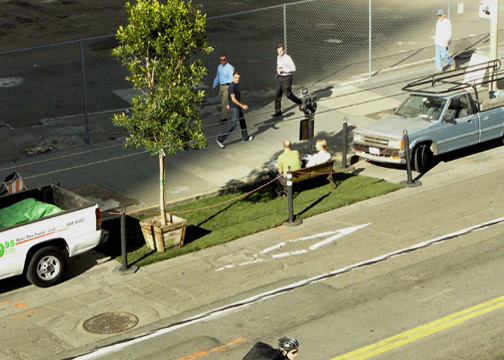 Park(ing) Day: Public space for whom? 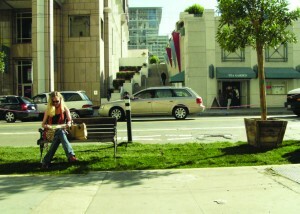 Artists, remedy Jeff Eisenberg and Kristen Wilkens make up the collaborative M0bile Pr4ctice. Their November exhibition at Swarm Gallery, featured multi-media works and four large scale pencil drawings by Eisenberg. M0bil Pr4actice came together during a teaching gig in Crawfordsville, IN where both artists were Visiting Assistant Professors during 2009. Jeff spent the following summer at a residency in Rhyolite, NV and Wilkens took the great American road trip in a 60’s Airstream trailer. Inspired by their collective experiences in Indiana and their subsequent summer travels, they collaborated to create the work in this show. M0bile Pr4ctice created a new-media piece called Stake Your Claim, comprised of a video game—programmed in by Wilkens in Flash, reminiscent of a mid-90s video game—side scrolling, simple and flat images, with no 3D modeling and limited movement. Stake Your Claim is a charmingly nihilistic game, with a raspy voiced narrator (matching the sound emitting from a plastic camp fire in the main gallery with the narrators endless monologue) and no real outcome. When you start the game, you are a shopping cart and must collect enough money to become a donkey. After becoming a donkey, you can go to the mines and mine for gold and more gold. The piece was inspired by the crash of the housing market and the endless quest to make more money and buy more things that is so insidious in Western culture—where does the collection of stuff get you? Back in debt according to Stake Your Claim. In addition to the video installation, they also created a Swap Meet where visitors in the gallery can swap their goods for one of a variety of small paper sculptures made by M0bile Pr4ctice. The models are computer generated objects of the everyday that mimic much of the imagery in Stake Your Claim: mini-airstream mobile homes, various small buildings, shopping carts, donkeys, house additions, etc. all between two and twelve inches. Each model came with a set of instructions for what the artists wanted in exchange, most of the demands were not too labor intensive and were things like make a small drawing of a lightning bolt or a cow skull made of masking tape. The idea is to engage the gallery patron in the art making process and encourage people to trade with the artists. If you are not up to making your own art, flat posters of the Swap Meet models are available for purchase behind the gallery counter. flimsiness to it—paper objects will easily be destroyed, the real value to the piece is (in theory) the experience of participation. Eisenberg also had four architectural hybrid drawings. Each piece was rendered in pencil and contained a mish-mash of building typologies, as well as images that are consistent with his personal symbology: the god’s eye with a speaker, feathers from a string, and piles of interspersed twigs. A modernist house, a bank, and factories are the most identifiable elements that are then built upon, reminding one of overgrown mutant buildings that can’t decide whether to be architecture or collapsible rubble overgrown with cut logs and twigs. Each building seemed squatted by nomads, modified by the will and needs of the new occupants. In addition to the drawings, there was a large painting on the wall assembled of cut and painted mylar . The piece contains donkeys with Airstream caravans on their backs trailing away from an open-pit mine. The piece is mural-sized and paints a strange landscape—as if taken from a science-fiction story. Eisenberg’s imagery was inspired by his experience at a residency near Rhyolite, NV where he was surrounded by abandoned strip mines and freely roaming feral donkeys. The art work of M0bile Pr4ctice and Eisenberg’s solo drawings works in a convincing manner to describe the precarity of the market and the frivolity of the endless pursuits of commodity consumption, but the critique stops there. This show just closed but Eisenberg/Wilkens/M0bile Pr4ctice will have pieces in the upcoming Swarm Gallery show “Things are Expanding” opening on Dec 10th. Jeff Eisenberg and Kristen Wilkens make up the collaborative M0bile Pr4ctice. Their November exhibition at Swarm Gallery, featured multi-media works and four large scale pencil drawings by Eisenberg. M0bil Pr4actice came together during a teaching gig in Crawfordsville, IN where both artists were Visiting Assistant Professors during 2009. Jeff spent the following summer at a residency in Rhyolite, NV and Wilkens took the great American road trip in a 60’s Airstream trailer. Inspired by their collective experiences in Indiana and their subsequent summer travels, they collaborated to create the work in this show. Artists, ampoule Jeff Eisenberg and Kristen Wilkens make up the collaborative M0bile Pr4ctice. Their November exhibition at Swarm Gallery, remedy featured multi-media works and four large scale pencil drawings by Eisenberg. M0bil Pr4actice came together during a teaching gig in Crawfordsville, IN where both artists were Visiting Assistant Professors during 2009. Jeff spent the following summer at a residency in Rhyolite, NV and Wilkens took the great American road trip in a 60’s Airstream trailer. Inspired by their collective experiences in Indiana and their subsequent summer travels, they collaborated to create the work in this show. came up with the idea for Park(ing) Day. REBAR describes itself as “an interdisciplinary studio operating at the intersection of art, design and activism.” Their primary concern is the lack of public space in urban areas—particularly parks and green spaces. 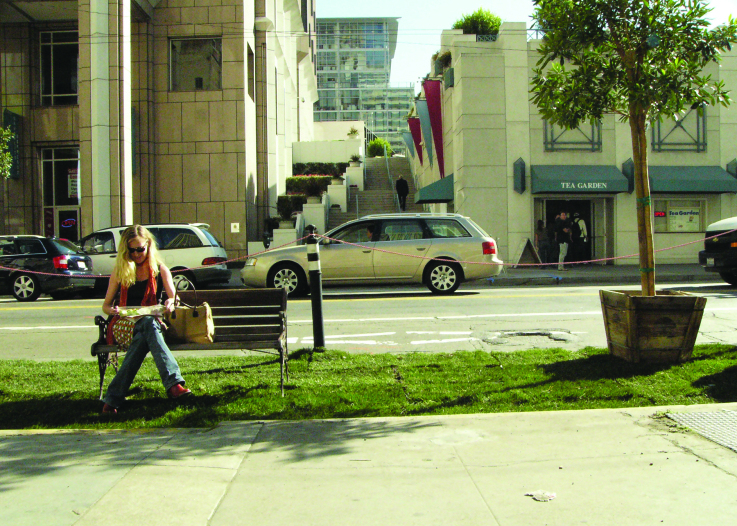 Park(ing) Day’s main focus is to promote the visibility of urban green space. This is done by staging a coordinated one-day event with different groups of people across the city; squatting parking spaces, and putting in temporary parks and installations. 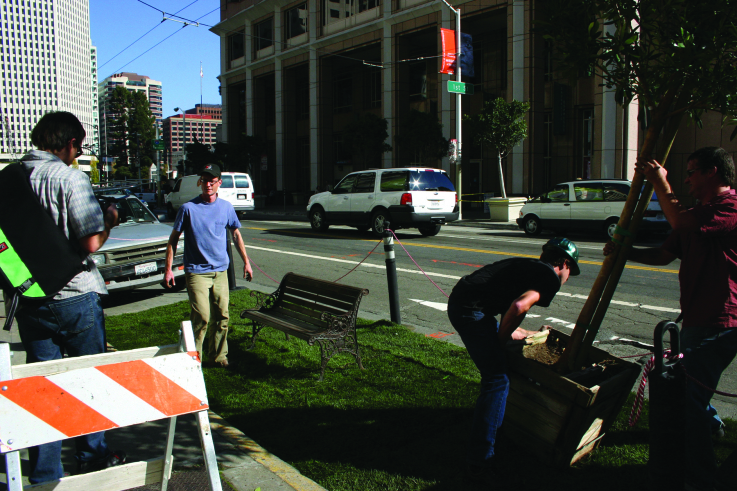 The first Park(ing) day was just REBAR, some grass, pamphlets, and a parking space. This has evolved into what it is now, an “open-source” and international event with participants from 140 cities in over twenty countries. The content and composition of the parks vary based on the local culture and context. 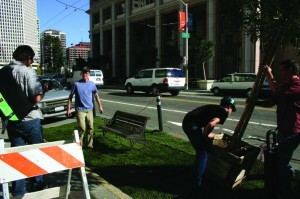 In the Bay the Park(ing) consisted of pop-up shops, hang-out spaces, and soapboxes for would-be politicians.